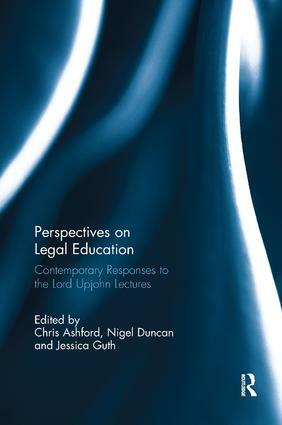 This edited collection offers a critical overview of the major debates in legal education set in the context of the Lord Upjohn Lectures, the annual event that draws together legal educators and professionals in the United Kingdom to consider the major debates and changes in the field. Presented in a unique format that reproduces classic lectures alongside contemporary responses from legal education experts, this book offers both an historical overview of how these debates have developed and an up-to-date critical commentary on the state of legal education today. As the full impact of the introduction of university fees, the Legal Education and Training Review and the regulators’ responses are felt in law departments across England and Wales, this collection offers a timely reflection on legal education’s legacy, as well as critical debate on how it will develop in the future. BySIR I . H. JACOB Q.C. Fourth Lord Upjohn Lecture 1974: Fact-finding: Art or Science? ByBARONESS RUTH DEECH D.B.E . Response: How Well Are We Moving Forward in the Teaching v Practice Debate in Law? BySIR FREDER ICK LAWTON P.C.